The original recipe, Kona Cornish Hens Island Style, called for a stuffing of tropical fruits, nuts, and plum brandy sauce. I eliminated this because I wanted to test my glaze idea first. I would like to try a version with local ingredients like plum, apricot, and almonds in place of the mango, pineapple, and macadamias. 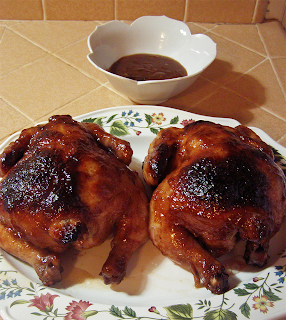 The original glaze used guava jelly, honey, and a whopping ½ cup of soy sauce. I substituted a little salt for the soy, reduced the amount of honey, kept the cinnamon, and did not use the optional rum. In my quest to reduce energy use/carbon footprint, I used the convection oven instead of heating up my regular oven. The hens barely fit, and I got my oven mits sticky with glaze every time I basted. The oven also cooled down too much every time I opened it up to baste. Next time I’d bake in the regular oven, with some potatoes and/or a veggie casserole to take full advantage of the increased energy use. UPDATE: July 30, 2011: For stuffing see Apricot-Plum Stuffing for Apricot-Honey Glazed Hens. Wash and dry the hens inside and out. Set hens breast-side-down in baking dish (to keep breast meat moist). Sprinkle with salt and pepper. Reduce oven heat to 325 degrees. Remove hens from oven and add ½ cup chicken stock to pan, scraping browned bits from pan corners with spoon. Depending on the size of your baking pan, you might have to add a bit more stock. Be sure that stock covers the bottom of the baking pan. Return hens to oven. Roast for another 30 minutes, approximately. 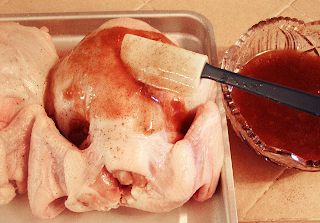 Check stock level during this time, and baste if you’d like a thicker glaze. Hens are done when they look browned and the leg joint moves easily when tugged. Remove hens to serving plate, and keep warm. Make sauce if desired: Stir liquid in baking pan, scraping up browned bits, then scrape into a saucepan. Add some more stock if needed to make about ¾ - 1 cup. Mix cornstarch with a little water, and stir in briskly. 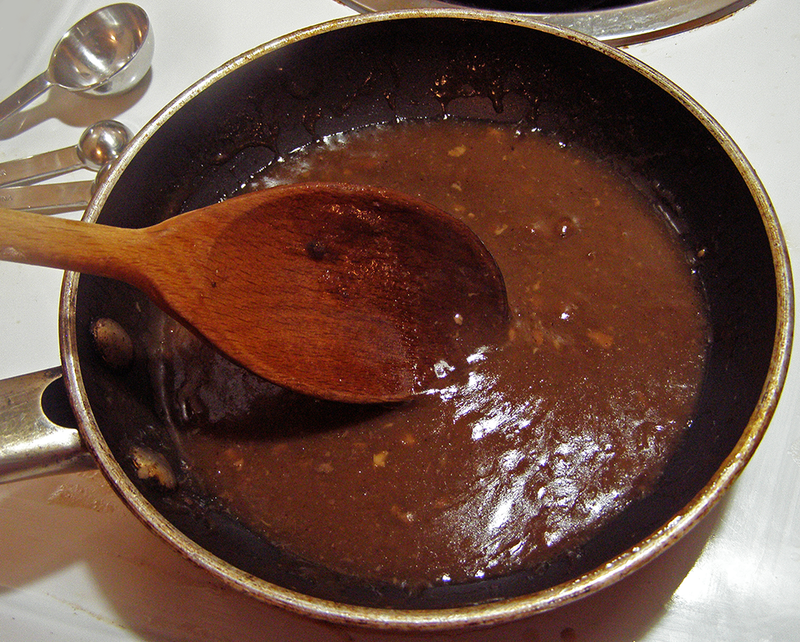 Heat on medium-high, stirring constantly till mixture becomes clear and thick, about 5 minutes. Serve sauce with hens.